A strong first-half performance laid the foundations for a comfortable 11-point victory for Antrim. The Antrim players celebrate in Croke Park yesterday. 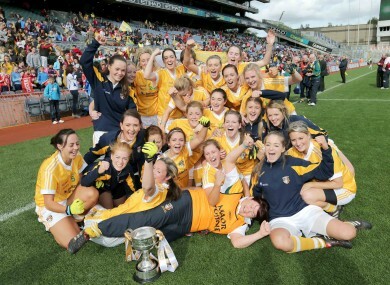 Antrim were crowned TG4 All-Ireland ladies junior football champions for the second time in four seasons at Croke Park on Sunday afternoon. A strong first half performance laid the foundations for a comfortable 11-point victory, and ensured Antrim’s return to the intermediate ranks. Louth had beaten Antrim by nine points earlier in this year’s championship but the tables were turned in emphatic fashion at GAA HQ. And having captured the junior title in 2009, the Saffrons are celebrating West County Hotel Cup glory again. Louth had scored 15-79 in their previous four championship matches but the Wee County failed to fire and slumped to a second junior final defeat in three seasons, having lost out to Limerick in 2010. Mairead Cooper was Antrim’s two-goal heroine in the 2009 decider but on this occasion, it was the turn of Northern Ireland soccer international Kirsty McGuinness to bag a brace of goals on All-Ireland final day. McGuinness netted a first half penalty and added her side’s third goal in the final minute to put the icing on Antrim’s cake. At half-time, Antrim led by 2-3 to 0-2 and the goals came as real sucker punches to off-colour Louth, who registered their first score of the game in the 22nd minute. Ten minutes elapsed before Cooper kicked the opening score of the game but that sparked a scoring spree for Antrim, who played against a swirling breeze in the first half. McGuinness converted her penalty in the 15th minute, with referee Seamus Regan correct in his decision to penalise Louth goalkeeper Una Pearson for a foul on Anna Finnegan. Pearson was sinbinned as a result and substitute goalkeeper Kelly Cunningham was helpless as McGuinness slotted home at the Hill 16 end. Three minutes later, Finnegan was on target for Antrim’s second goal, taking a pass from Cooper before beating Cunningham with a close-range finish. Louth rarely threatened in the first half but when Lisa Kelly had a sight of goal in the 22nd minute, Antrim goalkeeper Ciara McCoy pulled off a fine save. Player of the match McCoy would also excel in the second half, denying Louth corner forward Rosanna Heeney on two separate occasions as the Wee County’s search for goals became increasingly desperate. Cooper went close to netting a third Antrim goal in the 24th minute and three minutes before half-time, Finnegan rattled the crossbar as the Saffrons went in search of another three-pointer. In the second half, Antrim managed to keep their opponents comfortably at arm’s length. Louth could never get closer than seven points to Antrim and when they did threaten to score an elusive goal, McCoy was in inspired form between the sticks for the Ulster champions. Louth’s day was summed up in the 46th minute when former Dublin player Ann-Marie Murphy, normally so clinical, dragged a shot wide with just McCoy to beat. Antrim lost Cooper to a yellow card towards the finish but that didn’t stop the newly crowned champions adding a third goal through McGuinness, who beat Pearson as her near post. Scorers for Antrim: K McGuinness 2-0, A Finnegan 1-1, C Timoney 0-4f, M McCurdy 0-2, C Mullan & M Cooper 0-1 each. Scorers for Louth: M O’Connell, G Lynch, S Lynch, A.M. Murphy (f), K Flood, J McGuinness & S Byrne 0-1 each. ANTRIM: C McCoy; B Scullion, E Kelly, S Haughey; C McHugh, N Kelly, A Tubridy; C Mullan, G McGinley; C Carey, K McGuinness, C Timoney; A McAtamney, A Finnegan, M Cooper. Subs: M McCurdy for McAtamney (h.t. ), N Cooper for Scullion (50), D McAteer for McHugh (56), R Fulton for Finnegan (57). LOUTH: U Pearson; A.M. Lynch, A Carney, A McGee; M McMahon, M O’Connell, P Marmion; G Lynch, S Lynch; L Kelly, A.M. Murphy, C O’Connor, C O’Connor; R Heeney, K Flood, J McGuinness. Subs: K Cunningham for McGuinness (15), J McGuinness for Cunningham (23), V McGinn for Marmion (h.t. ), S Byrne for Flood (40), E Conlon for McGuinness (54). Email “Antrim prove too strong for Louth in ladies junior final”. Feedback on “Antrim prove too strong for Louth in ladies junior final”.